Get the perfect hands-free view of the screen with an air vent phone mount. A spring-loaded grip holds phones up to four inches wide and a patented metal hook hangs onto the vent for added security. A pivot ball lets you tilt and rotate it to get the just-right position—perfect for using GPS. The mount can work with the Square Jellyfish wireless charger, too, to double-up on functionality. Guaranteed to last a lifetime. Dimensions: 3.5" x 2.5" x 2"
FINALLY, A WELL MADE CAR VENT PHONE MOUNT THAT REALLY WORKS WELL! I have been searching for a Car Vent Phone Mount for quite awhile. NO LUCK…UNTIL NOW… THIS ONE IS PERFECT! I Finally Found One That WORKS!! Square Jellyfish is all about making our connected-to-our-phones lives better. Their air vent phone holder, tripod mount, and wireless car charger are built to double-up on holding phones and charging them at the same time. The air vent mount has a sneaky metal hook in the back that—unlike many other vent-based mounts—keeps it extra-securely tethered. 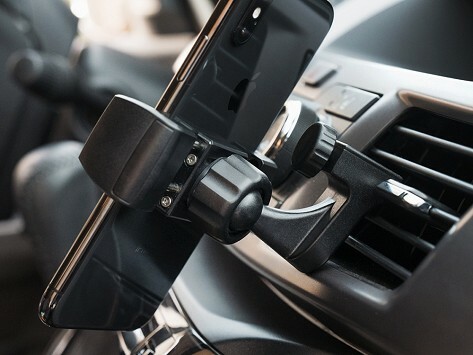 A spring-loaded grip holds a phone and case up to four inches wide, and a pivot ball joint lets you rotate and tilt to get the just-right angle—perfect if you’re using it with a GPS. If your phone is induction charging, add the wireless charging pad to the mount to power up at the same time. The tripod mount does the same hold-and-display job on spots like a desk or countertop, and it also works with the wireless charger. The compact design folds down to easily stow away, or pop in your bag to always have this smart solution on-hand.